Happy Monday morning! This weekend was so great- nice weather, fun times with friends, cleaning out/organizing my spring clothes, a jewelry box project with my mom... Here are some photo tidbits. 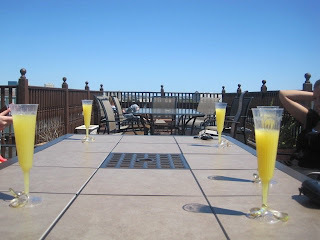 Enjoying mimosas on the roofdeck before the movie. My mom's new jewelry box! I want one now! thank goodness it was at the end of the night...ha. 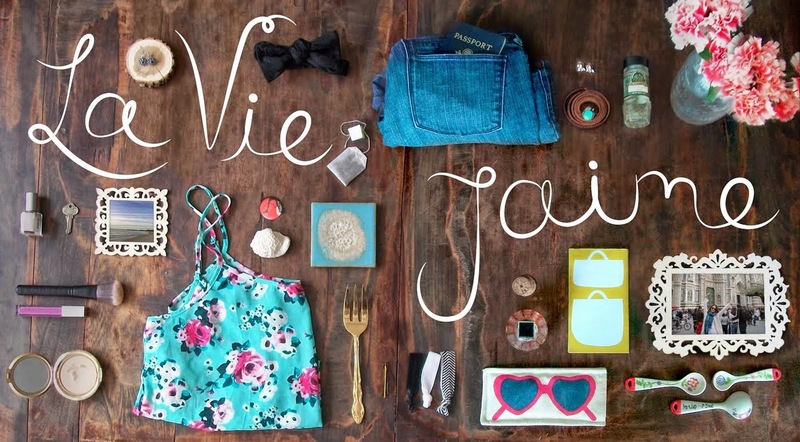 PS: I forgot to formally announce that I changed my blog domain to www.laviejaime.com last week. Sounds great! What a fab jewellery box idea. I want that jewelry box! So cool! i just made a similar jewelry display. loving your mom's though...and the mimosas pictured. sorry about your jeans. just means you get to go shopping. woohoo! So I now want that jewelry box, too! How gorgeous! Love that jewelry box! Sorry about your jeans :( Have fun finding a replacement pair! Love the jewelry box & bummer about the jeans. That happened to be once but much bigger and totally in my crotch :( Sounds like you have a very nice weekend! congrats on the new blog domain, and I had no idea KC had a movie?! Good luck finding replacement jeans...exciting to shop, but bummer bc of why you have to do it! Fuuuun! looks like you has an awesome weekend. I love these photos! Sorry about your jeans, though :( waaaay sad! Sounds like a great weekend! Mine went by in a whirlwind, but I did get to eat at this FANTASTIC loungey like place for lunch (warm Napa salad with shrimp, omg...). You're beautiful! 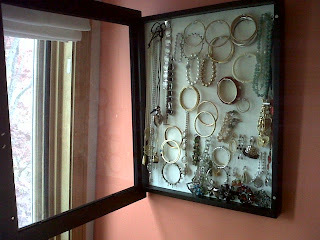 I want that jewelry display...I like that it has a glass cover~ dust free! looove the jewelry box!! great project!! and btw, I still wear one of my sevens all ripped, hahahaha! If those drinks were Bellinis instead of mimosas, I'd want to join you! A tailgating brunch? Freaking brilliant! So funny, I saw your comment on my blog the same time I was on yours! Love that jewelry box! Oh my gosh I LOVE that jewelry box! Adorable and so clever. I love that you brunch tailgated before the Kenny Chesny movie. That is hilarious and adorable! That jewelry box is amazing! I love that it hangs on the wall b/c it really frees up vanity space! All of my stuff is crammed on top of my dresser! I'll definitely have to find something to make one myself! Sounds like a great weekend! Oh no, I'm so sorry about your jeans! Hate it when that happens! But your moms jewelry box is so amazing!! Looks like a great weekend!!! I think my favorite is the Mimosa picture... kind of looks like the best. 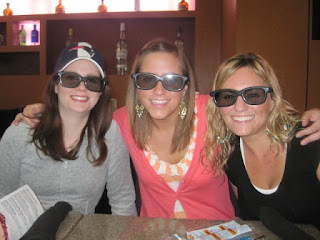 And yes 3-D glasses are the hotness. oooh i want a jewelry box like that too!! oooh a fun and productive weekend!! love that. minus the jeans rip. booo. and such a neat jewelry box idea!! I love that jewelry box! super cool! Sounds like you had quite a fun weekend! So sorry to hear about your pants though. :( That's always a sad thing. But as you said, at least they ripped at the END of the night. Lol. Congrats on the new domain name! Very exciting! I love that jewelry box! Did she make it? If not, where did she find it? Sounds like a fun weekend! I had a great one too. The weather was amazing on Saturday. Can't wait for this weekend...it's supposed to be in the high 70s and sunny!!! i think mimosas on a roofdeck should be a weekend staple.